Traditionally used to herd sheep, it is believed the Rough Collie's name is derived from the Scottish black-faced sheep called the Colley. Today their sheep herding days are far behind the breed, as they are kept primarily as companion and show dogs. Once known as the Scotch Collie, both the Rough and Smooth varieties were developed in Scotland and have been known since the 18th century. The two varieties are virtually the same except for their coat length and have been interbred throughout their history. Their origin is unknown, although it has been suggested that their ancestors came with the Romans to the British Isles 2,000 years ago. After Queen Victoria acquired a Rough Collie in the 1860s they became a fashion symbol and entered the show ring. Crosses began being made with the Borzoi to make the breed appear more glamorous, this made them taller and elongated their muzzles. Eventually the crossbreeding stopped, but the mark of the Borzoi can still be seen in today’s line. 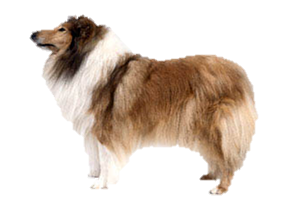 Is the Rough Collie Right for You?